Recorded at Immersive Studios, Boulder Colorado, except for track 14, which was recorded at StuSTu Studios, Los Angeles, California. Telarc International, a division of Concord Music Group, Inc. I had the honor of speaking with a friend recently, who took me with him for an interview with Otis Taylor ... we talked for hours, the notes and tapes have gone into an article, and hopefully a book regarding the artist. Here is an overview or those discussions, the album is sensational, and not to be missed. "I was a weird kid," says bluesman Otis Taylor. The sight of Taylor riding down the street as a teenager, perched on a unicycle while flailing away on a banjo, turned quite a few heads in Denver during the mid-1960s. He had been studying the five-string instrument at the Denver Folklore Center and learning to play mountain music in the styles of Appalachian legends Dock Boggs and Roscoe Holcomb. Taylor may not have realized at the time that it was odd for a black kid to play banjo, but it did hit him one day that doing so could be dangerous. His banjo teacher suggested that he "go down South and enter some of those banjo contests." This was at a time when African Americans in Southern states were being beaten and bombed by the Ku Klux Klan and other opponents of racial integration. "Where?" Taylor recalls responding in disbelief. "There was just hell going on down there. I freaked out. These people hate me. Why am I playing their music?" Taylor put down his banjo and took up blues guitar and harmonica. It would be a number of years before he again picked up the banjo, after learning that it is of African origin. Since the February release of his eighth CD, "Recapturing the Banjo," Taylor has been on a crusade of sorts to make people aware of the banjo's origin and of its role in early blues, ragtime, jazz and jug-band music. 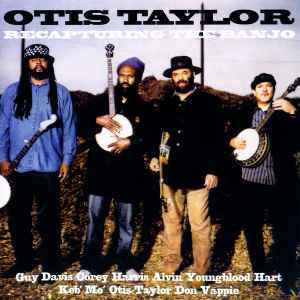 Besides Taylor, who also sings and doubles on guitar, the disc features five other African American musicians playing banjo: prominent young bluesmen Guy Davis, Corey Harris, Alvin Youngblood Hart and Keb' Mo' and New Orleans jazz and ragtime picker Don Vappie. Original compositions by Taylor - one is about fleeing the Ku Klux Klan, another about the Middle Passage on a slave ship - Hart and Keb' Mo' are mixed with such traditional numbers as "Hey Liza Jane" and "Deep Blue Sea," the Creole folk song "Les Oignons" and renditions of the 1960s pop hits "Hey Joe" and "Walk Right In." The latter song, a No. 1 hit in 1963 by the Rooftop Singers, had been written and first recorded more than three decades earlier by Gus Cannon, a black banjo player. "I just wanted to set the record straight," says Taylor, who earned his living as an antiques dealer before releasing his debut CD, "When Negroes Walked the Earth." "Some people know, but I wanted the masses to find out. I wanted to get the word out, just like the traffic light or the iron lung or peanut butter; sometimes it just gets lost that African Americans did certain things. Black people don't know it either. I don't want to recapture it and take it away from the whites. I just want to recapture our culture with it." Last month, Taylor took Davis, Harris, Hart and Vappie, along with his regular guitarist, John Richardson, and Taylor's 21 year old daughter, vocalist and bass player Cassie Taylor, to England for a week's worth of concerts. The opening act for two of them was Bassekou Kouyate, a musician from Mali who plays the ngoni, an oblong-shaped cousin to the banjo. "It sounds more like a lute," Taylor says of the ngoni, "but it also sounds like a banjo because it has a head." The American musicians jammed with Kouyate's eight-member band at the conclusion of each show. Taylor says that during a sound check, they listened to him play and sing "You Know What I'm Talkin' About," a new tune that Kouyate had written in a style inspired by pioneering Mississippi bluesman Charley Patton. Africans tuned right in. "I noticed that the guys (Kouyate's musicians) in the back were kind of jumping around," Taylor recalls. "When we did it in the concert, his wife started singing like she had sung that song a thousand times. I just hit this beat, and they were off to the races. It had some kind of beat that they do, but I don't know what it was. They speak French, so I couldn't really communicate with them. "It was surrealistic to play something, and all of a sudden they started singing like they had been playing the song all their life. They were totally into it. They're laughing and smiling, like they knew something I didn't know." Taylor's style of music has been called "trance blues" because it utilizes few chord changes. "If you listen to African music, there's not a lot of chord changes," he says. "It's more trancelike." One chord songs, combined with rhythmic syncopation, can cause listeners to "lose a sense of time," he explains. "People dance for hours. If you do a round of chord changes, like 'Row, Row, Row Your Boat,' you can get a trancelike thing going, too. If you get too many chord changes, it breaks the trance."